My mid-summer visit to Kew Gardens was easily organised. I had a whole spare day in London, and wanted to take a river boat trip on the Thames. 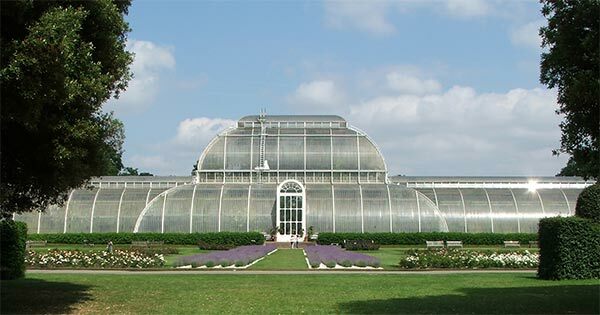 I could spend a day at Kew - the perfect destination. And the perfect start for a visitor to London - famous Big Ben bonging the mid-day chimes as my boat headed off up-river from Westminster Pier. But what would the gardens themselves be like? Oops. Initial disappointment, understandable as I made a beeline for the Azalea Gardens and the Rhododendron Dell - wrong season! 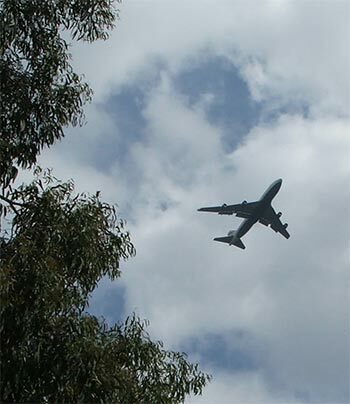 Noisy jet planes overhead - this wasn't the gentle English parkland ambience I'd been looking forward to. But it only took a couple of magnificent glass-houses, an extremely long vista, and a clutch of New Zealand cabbage trees to cheer me up. Here are my impressions from A Day at Kew. Sorry - but I'll start with the planes, to get them over with. Kew is underneath the flight approach to Heathrow, London's super-busy airport. Enough said. 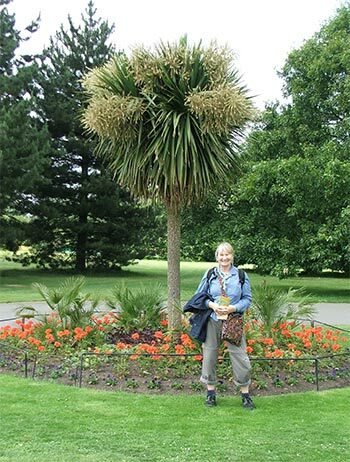 There were many grey-haired gentlewomen visiting Kew. On the visitor's trolley-bus they discussed what the royal family did last weekend. Around the lake they took up prime painting positions - a clutch of grey water-colourists, dabbing brushes into pots and producing green blobby shapes on paper (I peeped). 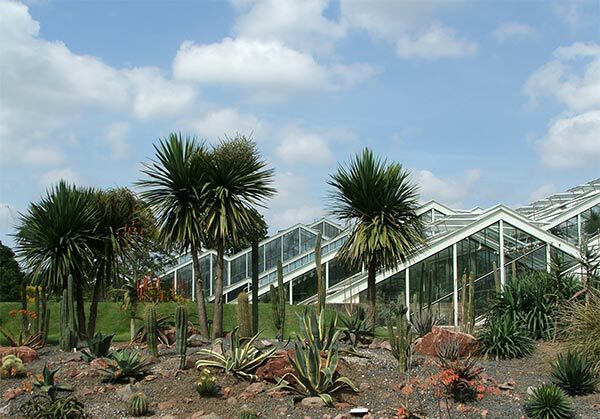 A newer set of ten computer controlled glass-house rooms have recently been opened - they're collectively called the Princess of Wales Conservatory. As a dutiful mother of a son who has a cactus collection, I took a few respectful photographs in the arid, dry room. These conservatory rooms had some wonderful plant collections - definitely the top attraction at the gardens. The scree garden at the entrance has a trio of Cordylines standing guard over some succulent desert-style spikies. Odd company for a native plant used to the greenery of the New Zealand native bush. But I was getting used to Cordylines popping up in settings both expected and unexpected. It's far too silly that the English call these Cabbage Palms - or even Palm trees. 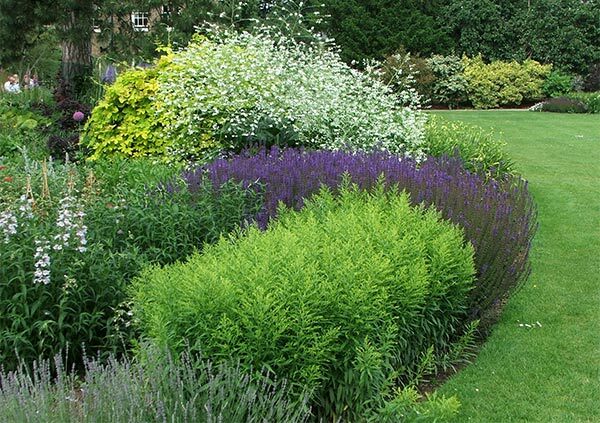 I found green Cordylines sitting in beds surrounded by flowers, and red Cordylines in pots. And yes - I greeted each one, took its photograph, and giggled. And I politely harassed an English gentleman to take my photograph in front of the best one. He probably heard my accent and thought I was a silly Australian! So my Day at Kew ended up being a lot of fun. It's a pity that I completely missed the biggest glasshouse, called the Temperate House. I can't believe I did that - how embarrassing. Memo to self - next time, read the brochure before you start wandering! And stop getting distracted. 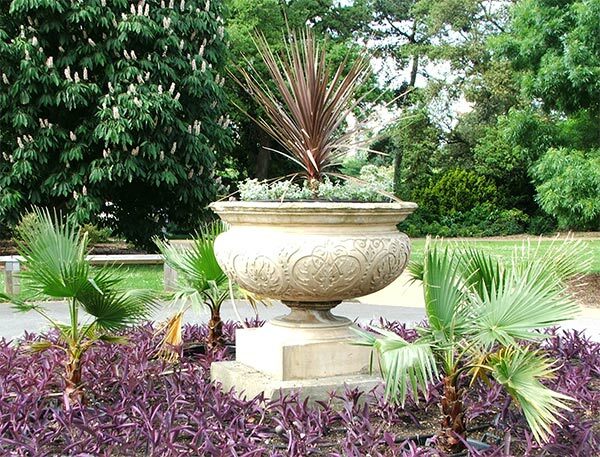 There's much more to Kew than jet planes and New Zealand Cabbage trees!